The year is 2017. The world economy has collapsed. The United States has sealed off it’s borders and has become a military controlled police state which controls TV, movies, art, books, communication and censorship. In the police state America has become, criminals have a choice. They can serve their sentences in prison or they can take part in “The Running Man” a government owned violent game-show where contestants running for freedom are pursued by “Stalkers” wrestler-like bounty hunters. 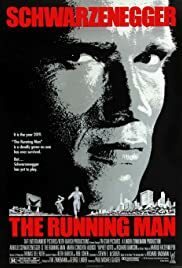 “The Running Man” is the top rating show on network TV and Damon Killian, the creator and host is the most popular entertainer in the US. But one man has yet to play… Former L.A. police officer Ben Richards, framed for the massacre of innocent people, when disobeyed orders is recaptured, after escaping from prison. Ben is forced to appear on “The Running Man”, joined by resistance fighters William Laughlin and Harold Weiss and Amber Mendez, (a network employee who Richards took hostage and she turned Richards into the authorities) are chased by The Stalkers, as they search for the secret base of the resistance, as they bid to broadcast the truth about the government and prove Ben’s innocence.